The Bridge School offers flexible online curriculum for middle & high school students. Their mission “is to enable students to become self-motivated, independent learners.” It’s a great option for students who need an alternative to traditional schools. As part of a larger marketing campaign (via Marketing Refresh), The Bridge School needed a website revamp to attract new students. As a school, their funding for web design was limited. Instead of reworking the entire website, we focused on a complete overhaul of the Home page. DesignBigger did an great job of moving the site over to WordPress and using our Home page design as a base for the other page templates. The Home page needed to target the various types of students who may require an alternative school, showcase their features, and most importantly – provide a call to action front and center. We designed the website to look both professional and academic, so parents feel comfortable enrolling their children. 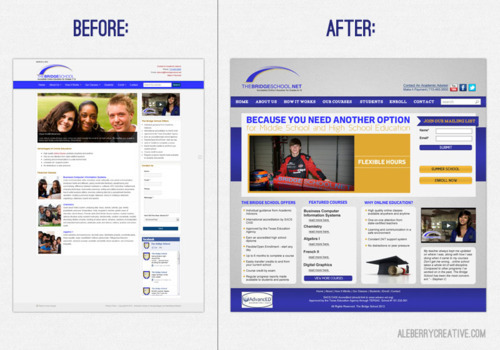 We wanted the school to maintain a consistent brand image, especially across online media. To supplement their marketing collateral, we also designed a couple online advertisements, a Facebook cover design, and a email marketing template (using MailChimp). This project is a great example of how a professional, custom website design for academic institutions can be great for marketing and overall brand image.